If you recently got out of a relationship and can't stop thinking about your ex I know EXACTLY how you feel. And you're thinking about reaching out to your ex, but something tells you that's not a good idea. And on top of that you wouldn't know what to say anyway. So now you just wish there was a switch you could flick to make all the thoughts about your ex go away. Unfortunately, there is not such a thing. In this post I will show some techniques you can use to get someone off your mind so you can get a peace of mind. Having a constant train of thoughts about your ex when you want to get over them can be very annoying. 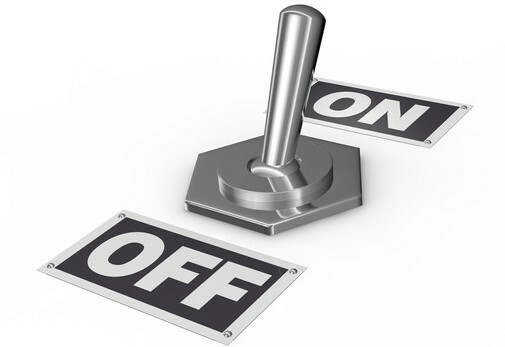 You can feel as your mind is going CRAZY and there is no way to switch it off. Some even claim it can be a similar experience to having a OCD. It drives you to madness, especially when you’re dealing with tasks that need your full attention and focus. The problem with wanting to stop thinking about somebody is that when you realize that you need to stop, it’s often too late. You have already built so much attention around this person in your head, that your mind is now gotten accustomed to it. When we think about somebody a lot, our mind believes that since we think so much on this, it must be very important, which reinforces the pattern. And this is why it can be so hard to stop thinking about someone. So in order to stop obsessing over someone, you have to go back and understand the root cause behind why you ended up with this obsessive thinking about your ex in the first place. Let me introduce you to the Idolizing loop. The reason you’re not able to get your ex out of your head is probably that you’ve been a victim of putting them on a pedestal. This includes thinking about everything that you liked about them and how good they made you feel, how funny they were, or how amazing their family was. We do this to keep the good feelings from the relationship within us alive because some part of us don't want to let go and move forward. If this sounds familiar, it's likely that you currently are going through the 4th stage of breakup grief. This is referred to the bargaining/relapse stage where there is a part of you that's holding on to the idea of getting back together with your ex. Learn more about the 7 stages of breakup grief here. Holding on to good memories from the relationship can make you feel like it's still alive, but it also makes the moving-on process much harder. When you idolize, you create a reality that does not exist. It’s fiction built up in your head. And your ex becomes this perfect person who you will never ever be able to replace. When you start worshipping, you build them up, which makes you think about them even more, and eventually, you get stuck in an idolizing loop that just gets stronger and stronger. The tricky thing about the idolizing loop is that you don’t realize you are doing it; you actually believe that what you think is true. But what you fail to notice is that you pay attention to the negative aspects nowhere near as much as you do the positive ones. Anyone can become amazing if you refuse to notice their negative aspects. Your job is to be your own idol police and make sure that for every unwanted or intrusive thought about your ex that shows the slightest hint of you worshipping them or your relationship, you force yourself to balance it out by thinking about the arguing, how different you were, or how you could not make certain areas of your relationship work out. You could say the idea is to "trash think" your ex. But I would recommend staying honest about the image of who they ACTUALLY were to you in your relationship. But this time, without any worshipping. 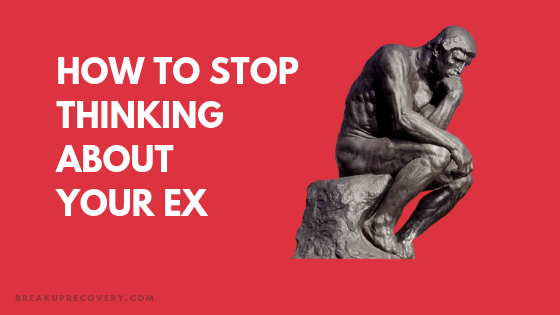 Stop Thinking About Your Ex Right Now! Find out how to stop thinking about your ex and transform your breakup into the best thing that could have ever happened to you! Your effort can determine how long it will take to get over someone and for you to get back to your normal or even happier self. Most people don’t use the things they learn; they take the knowledge and feel a little better about learning something new, thinking that they will use it later or when the right situation presents itself. I encourage you as you read the following two exercises to stop reading and make a list of what you need to do and then start executing on what you just learned for best results. This exercise will help you when you can't stop thinking about someone and having idolizing thoughts about your ex by balancing out the good with the bad. It will provide you with clear reasons why your longing thoughts about your ex are representing a fake reality that your mind is simply making up because you are currently undergoing change. Write down a list on your mobile phone with your ex’s ten worst traits. List the things that you disliked about them, things they did that made it harder for the relationship to work out, and personality traits that didn’t match well with your personality. Prioritize them by having the most critical traits at the top and the less important ones toward the end. Make your list easily accessible. If you can, add a shortcut to your Ten Negative Truths list on the home screen of your mobile phone. Go back to this list every time you find yourself idolizing and going down memory lane with positive memories of your relationship with your ex. This exercise will help to make sure that you don’t dwell on the past and get stuck thinking about what caused your breakup. Use this exercise to become free from any regrets or thoughts is distracting you from thinking clearly. Avoid doing this exercise in a familiar place, like in your bed or anywhere in your home. This is to avoid enforcing the habit of thinking about your ex when in your everyday environment. Go somewhere nearby, like a café, library, or park, where you will be able to think without being disturbed. Further down, you will find a set of questions about what caused the breakup. First, you will write down the answer from your own perspective, then you’re going to answer the same question but this time from your ex’s point of view. This can be challenging, but you probably know them better than anyone else, so just do your best. Take into consideration their way of thinking and their explanation as to why things ended. When you have answered the questions from both your own and your ex’s perspectives, read and compare the answers. Look for mismatches in the explanations, then proceed to the next two questions, which are about making discoveries and writing down a list of anything that you and your ex might have failed to notice about the cause of the breakup. The reason I want you to write down what your ex might have failed to notice is to force you to take on their perspective. This might help you learn new insights about the breakup as a whole, which might allow you to view things through a larger perspective. When you’ve finished writing down any new insights, put a star next to those you think would have helped you make better decisions had you known about them before. These are your new tools in your toolbox that will help you make better decisions in the future. Schedule a time for when you are going to think about what happened and why things ended as they did. 1. Write down what you think are the main reasons that caused the breakup. 2. Let’s say you were your ex. Ask yourself the same question and write down what you think are their main reasons that caused the breakup. 3. When comparing the reasons from your and your ex’s perspectives, write down anything that now comes to mind that might have caused the breakup, which you might have previously failed to notice in the relationship. 4. Now ask yourself the same question as above, but answer from your ex’s perspective. What could your ex possibly have failed to notice in the relationship that caused the breakup? 5. Write down any new insight you gained about what might have caused the breakup. 6. How can your new insights help you make better decisions/actions in the future? Write it down. Here are some more actions that will take the pressure off your mind if you can't stop thinking about someone. What methods are you going to try to stop thinking about your ex? Ask any question you might have or share any experience that could be inspirational to others.